Top floor unit located in OOB's newest ocean front resort building, the Grand Victorian. 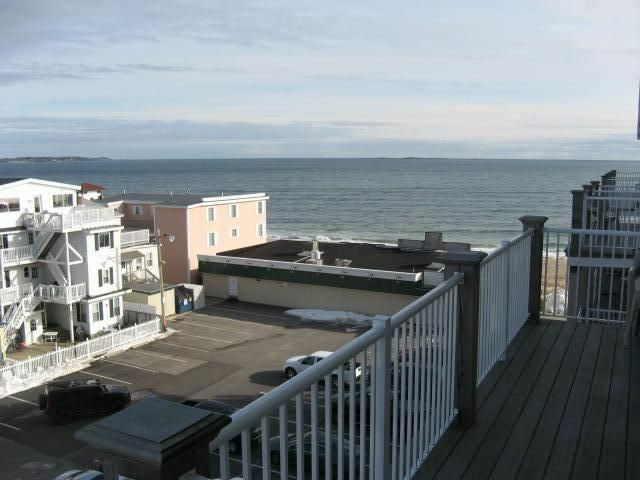 Luxury Condo, 2 bedroom, 2 bath with ocean views, located in the center of downtown Old Orchard Beach, Maine. Indoor pool, sauna, workout room with 3 TV's, plus retail shops and restaurants on the first floor. Unit sleeps a maximum of 8 with queen sleeper sofa in living room and 2 roll away beds. Walk to everything!! Fireworks every Thursday during summer. Amusement park for kids nearby. Owner purchased the unit brand new in 2006. Great for those who enjoy the activity of the center of town. Walk to EVERYTHING, including the Amtrak Station to and from Boston. Excellent for you to include a day trip to Boston! The building is ocean front. Many amenties available in the building: Sauna, Indoor pool, Workout room, Restaurant and Shops as well as a Spa. Whether a couple or a family, Bob and Jennifer's unit is great located right in the center of Old Orchard Beach. The accommodations are both attractive and spacious, with more than enough space for all to be comfortable. While the unit is not beachfront you are still rewarded with a nice view to the water...and the building gives immediate access to the beach and Pier area. The kitchen is extremely large with beautiful granite countertops and is well outfitted for basic cooking needs. Others have mentioned the train noise....and as it runs right thru OOB there are few in town who won't hear the whistles......but we never found it offensive or disturbing, at times commenting that we hadn't noticed it go thru during the day. And it never kept us up at night. Bob was so extremely easy and prompt to deal with before and during our stay. It was a pleasure. We would highly recommend this unit. Thank you Mike and Linda for taking the time to write your very thoughtful review. I’m glad your trip went well and you were great guests to have. We would love to have you return with us if your travels take you back to Old Orchard Beach. Have a great holiday season and thank you again for staying with us. Close to Portland and Kennebunkport. Enjoyed lobster! Enjoyed our stay. The unit is very clean and has all of the essentials. The beds are comfortable. Fifth floor unit has a view of the water. TV in both bedrooms and living area has a good basic cable channel selection. The owner is fantastic with communication and very available to answer any questions. Would highly recommend this unit for your visit!! The only downside to our stay is the train that runs through Old Orchard Beach, it is very disruptive to getting a good nights sleep. Noise was a problem. Three trains a night. Weekend parties. Beside the key problem, it is a very noisy unit. The train blows its horn three times a night. The unit its said was good. The staff there are very nice! It is right in the middle of everything and the condo has everything you need!! Had a wonderful weekend! Thanks so much!